Her first English written book is on pre-order and you can buy it here. 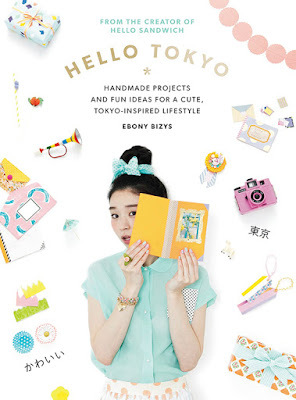 It is called Hello Tokyo and it looks awesome and I will be sure to get my hands on a copy.. It even has a gold foil spine, awesome right? I went to Tokyo years ago and would love to go back, it is such a crazy and fascinating city. Hello Tokyo is a guide to living a handmade lifestyle in Tokyo, it has over 30 craft projects and lots of snippets into the crafty side to Japanese life. She also makes and sells fun little zines that are all about where to find the cool, delicious and crafty things in Japan. I wish these existed for other Asian cities and am wondering if I should attempt to make one for KL!? So anyone who is dreaming of Japan, take a look! She also sells things in her shop here.